On Wednesday, 26 June 2019, from 1 p.m. to 3 p.m. at the secondary school "Clara Zetkin" in Freiberg, Dörnerzaunstraße 2, the annual "Festival of Cultures" will take place. Students of the 6th grade who come from a country other than Germany will present their home countries. They will design information stands with posters and typical local food and a varied stage programme. All 5th and 6th grades of the school - about 250 pupils - take part in the festival. The project "International Students in Schools" was invited to participate in the celebration. We are looking for international and German participants who have at least A2 or higher German language skills and enjoy working with children and young people. In addition, the organizers would be happy if we could support the school in setting up and dismantling. "International students at schools" brings students from all over the world in contact with pupils in Freiberg and the surrounding region (see our reviews). In this way, valuable knowledge passes on to Germans. Knowledge about traditional and popular culture, religion, language, geography and politics of countries far and near. Students give insights into first-hand experiences. Their stories cannot be found in school books. Pupils are actively involved in class and thus creating an intercultural dialogue between them and the international students. The project aims to arouse interest in other countries and ways of living. It can show similarities and differences between countries and can help to break down prejudices. In November 2010 the project was awarded the "Saxon Integration Prize". Classes can be very varied: international students present their country, also by way of songs, dances, music or cooking together. So far, our international students enriched foreign language, geography and ethics classes. Topics regarding the history or economy of the respective country can also be part of the class. The students can be incorporated in a single lesson, project days or in a complete teaching unit. ISIS projects should be prepared together by the students and the teachers. So far, students from the following countries took part in the ISIS projects: Australia, Brazil, Cameroon, China, Colombia, Czech Republic, Egypt, France, Hungary, Iceland, Indonesia, Ivory Coast, Kenya, Mexico, Mongolia, Norway, Poland, Spain, Syria, Turkey, Ukraine and USA. We are happy that the ISIS project was awarded with the Integration Prize 2010 in November 2010 and say thank you to all (doctoral) students and project coordinators who contributed to the project’s success! Manuela Junghans, member of staff of the International Centre and student Sandra Jahne accept the prize from Christine Clauß, Minister of Social Affairs and Consumer Protection and Martin Gillo, Saxon Commissioner for Immigration. A jury of eight choose the prize winner among 61 applications. “Our society will benefit from integration”, says Christine Clauß at the awarding ceremony of the Saxon Integration Prize. 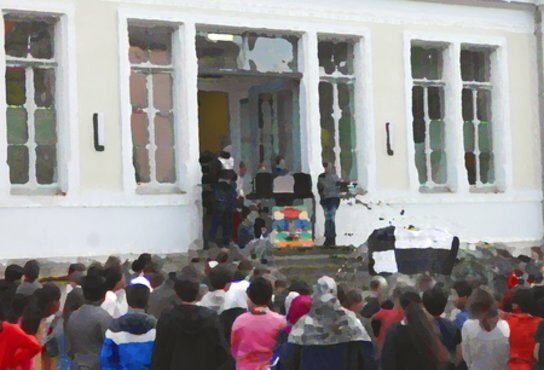 2011 saw the first long-term ISIS project at the primary school "Georgius Agricola" in Freiberg. From May to December 2011 Nazaruddin Raja, studying International Management of Resources and Environment, was involved at the Freiberg primary school "Georgius Agricola". At his first visit to the school Nazaruddin Raja presented his home country Indonesia and then showed a video of an Indonesian dance. This and other dances Nazaruddin Raja had learned with orphans from Aceh/Indonesia who had lost their parents by the tsunami. Dancing and music helped the children to come to terms with their traumatic experience. The pupils were fascinated by the video and only a few days after Nazaruddin Raja’s visit the first dancing rehearsal took place. The result was something to be proud of and already on 18 June 2011 the pupils showed their skills at the “Science Night”. After this first performance the rehearsals were continued and at the “Festival of Cultures” on 19 November 2011 the pupils had their second successful performance. On 10 February 2012 the Indonesian dance project at the "Georgius Agricola" primary school was concluded festively. Nararuddin Raja and Manuela Junghans, member of staff of the International Centre, gave all pupils who took part in the dance project a t-shirt as a present. 2012: Syrian sounds at the primary school "Carl-Böhme"
10 February 2012: Eva Abdullah greeted the 4th form of the primary school "Carl-Böhme" with a warm "Marhaba" and presented her home country Syria. Ms Abdullah currently studies for her doctorate at the Institute of Mechanical Engineering at the TU Bergakademie Freiberg. Her daughter Mariam, 9 years, is also a pupil at one of the 4th forms and was pleased that the many facets of Syria as well as the scenic and cultural attractions of the country were presented. She proudly said: "The capital of Syria, Damascus, is one of the oldest inhabited towns of the world!" Mariam’s classmate Marissa (10 years) particularly liked the many sights that Ms Abdullah had shown in her presentation. Furthermore, the pupils were fascinated by the animal world, the food and the Arabic characters. Impatiently the pupils put their hand up when Ms Abdullah asked for their names to write them on the blackboard in Arabic. Julian (10 years) tells excitedly: "I find the characters cool." Headmistress Ms Borrmann welcomes the continuous cooperation with the International Centre "since such ISIS projects support multicultural living together." Form teacher Ms Ludwig supports this view: "I think it is great that such projects take place and I am happy to be part of it as well." If you are interested in the project, please send an e-mail to this address: isis iuz [dot] tu-freiberg [dot] de. Please note: Due to long term construction work, access to Prüferstraße 2 is only possible by crossing through the university building Schlossplatz 1.